These days, older racers know their time is just about done. Sadly enough, the fact is there isn’t a whole lot of room for 40-somethings in the upper echelons of the racing world anymore, especially in the world of NASCAR. If you aren’t in Cup or Busch already when you reach 40 (or sometimes 30 these days) than you are considered over the hill, washed up; it’s time for you to throw in the towel. When not behind the wheel, he’s working on racecars; not just his own, but his team owner’s. And he even services many of his competitors. 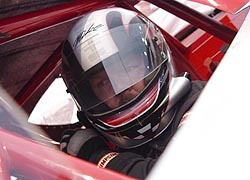 It is really a dream life for a pure racer who enjoys the sport and isn’t set on conquering the NASCAR Nextel Cup world. “I just love racing and the atmosphere around it,” says Fritts. “But racing today is a funny sport. All of us older guys know that it is just, well, different from when our fathers were in it years ago and even when we started racing so many years ago. Back when I first started, you just raced for fun because you loved it. Maybe you would get offers to get in bigger and better cars, maybe not; it wasn’t that big of deal. coming in here and that is what they want. That is fine. If I was just starting out in today’s world of racing, I might be doing the same thing. But when you get to a certain point, you just know that you are racing because you love the sport and I do. “So now I run his race car shop, Briar Racing. We keep up in-house cars and some other people’s stuff. We keep up Jerry Artuso’s stuff. They live in Canada, so we keep up their stuff so they just fly down, jump in their racecars and go racing and fly back home. We do a lot of outside work with setup stuff on people’s cars too. It is all just word of mouth and we have plenty of work that way. We don’t do any advertising. 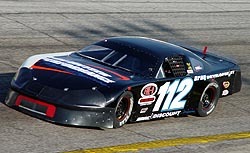 Fritts had his own Super Late Model for some time and kept it at Briar Racing. 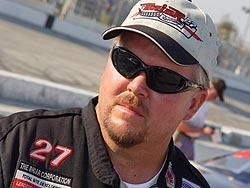 His Super Late Model actually won the Speedweeks title with in 2004, but now, he drives for who he can, when he can. “Last year (2004), I think we only raced five or six times. You miss being behind the wheel. It is awkward to jump in a car every two or three months. I guess it is good because it makes me feel good to run as well as we do, but I miss it for sure. Fritts has already found success this year in both the #27 owned by Mike Good and the #112 owned by Frankie Grill. So why would just working at a race shop and driving a few races a year, especially with the talent that Fritts obviously has behind the wheel, seem like a dream job. Mostly, it is because of the relationship he has with Good. Good also races sometimes, but does it just for fun. This year could be a little different for Fritts though. His name might just become a little more noticeable. “We are going to try and do some traveling races this year. We just bought a new hauler and we are looking to go and do some traveling and run some Southern All Star races this year. I think we could run really well and we can be successful, and if we do, that will make things even that much better. And that’s part of what drives Mike Fritts, the competitiveness of racing. Although he would probably tell you, if it wasn’t fun, he probably wouldn’t be doing it. In Pro Cup, ASA (when it was still around) or ARCA, talented 40-somethings can still find themselves a home and race for a living. Guys like the Gary St. Amant, Frank Kimmel and Bobby Gill are doing that right now. Then again, sometimes it’s best to just sit back, take in what you’ve got around you, and decide if it would even be worth fighting for as a veteran of the sport. That’s exactly what Florida short track race 42-year-old Mike Fritts did and he’s got it pretty good right now. Fritts is one of the best Super Late Model drivers in Florida, and maybe one of the best in the entire Southeast, but very few people outside of just a few tracks around central-Florida really know his name. 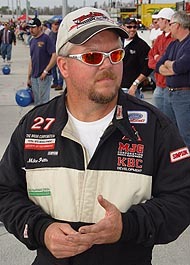 For the last several years, Fritts has spent all of his time working on racecars and driving some of the best around. He wins races about as often as he enters them. He races no particular series for a living and doesn’t chase points anywhere. He just picks and chooses the races he wants to run and much of the time, wins them. “But I loved the sport, so I started in spectator races, where they let you bring your street cars out on the track. That was probably around 1983. I did that for a year and just have fun. We’d ride up to New Smyrna Speedway ever weekly to run this old Nova that I had in the one-on-one races every single week. Before you knew it, Mike got hooked up with another Mike, and the partnership since then has made Fritts’ life and job one that many true racers would just dream of. “I hooked up with Mike Good. I’ve been through a few cars owners, all really good people, but as far as having the equipment that Mike Good has, I never had that stuff before. He is a good man.